Reuse your wine corks by turning them into custom stamps! 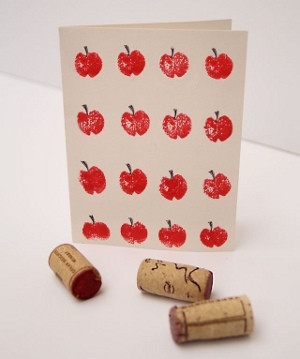 With these ideas for wine bottles and corks, you can make a cute apple stamp to use for autumn greeting cards, back to school crafts, and more. Using a sharp knife or a craft knife, simply remove from the cork two notches, one for the indentation at the top of the apple and one for the indentation for the bottom of the apple. That's it! Stamp carefully, with a towel under the cardstock to enable a better print, and set aside to dry before adding details. Find even more ways to recycle wine corks in our adorable list of 17 Whimsical Wine Cork Crafts.